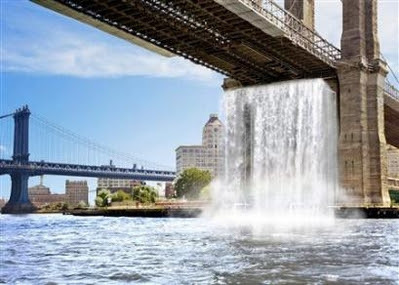 This image of the Brooklyn Bridge is courtesy of Danish artist Olafur Eliasson, who is planning to create four massive waterfalls as part of a public art project. No doubt it'll make a big splash (pun intended) starting this July through October. There is also an exhibit of his work currently on display at the SF MOMA through Feb. 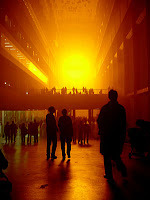 In 2004, we had the chance to see his amazing exhibit "The Weather Project" at the Tate Modern in London where he created a massive reflecting sun. People would lie on the ground of the gallery, basking in the artificial light, grateful for any respite from the bone-cold, bitterly damp winter. On the tube: HBO's Flight of the Conchords. These two zany New Zealanders, Jemaine and Bret, are a riot to watch, especially when they break into song. Watch 'em on YouTube: Most Beautiful Girl in the Room. The lyrics are priceless: "You're so beautiful. You could be a part-time model. You'll probably have to keep your normal job."